"BSOD" and "BSoD" redirect here. For the "other", less popular, error screen, see Black Screen of Death. A stop error, better known as a Blue Screen of Death (also known as a blue screen or BSoD), is an error screen displayed on a Windows computer system after a fatal system error, also known as a system crash: when the operating system reaches a condition where it can no longer operate safely. BSods have been around since the first Windows edition, Windows 1.01. It appears as a blue screen with white letters telling of a problem. BSoDs have been present in Windows NT 3.1 (the first version of the Windows NT family, released in 1993) and all Windows operating systems released afterwards. (See History of Microsoft Windows.) BSoDs can be caused by poorly written device drivers or malfunctioning hardware, such as faulty memory, power supply issues, overheating of components, or hardware running beyond its specification limits. In the Windows 9x era, incompatible DLLs or bugs in the operating system kernel could also cause BSoDs. Because of the instability and lack of memory protection in Windows 9x, BSoDs were much more common. On 4 September 2014, several online journals, including Business Insider, DailyTech, Engadget, Gizmodo, Lifehacker, Neowin, Softpedia,TechFactsBD, The Register, and The Verge attributed the creation of the Blue Screen of Death to Steve Ballmer, Microsoft's former CEO, while citing a source that does not say so: An article by the Microsoft employee Raymond Chen, titled "Who wrote the text for the Ctrl+Alt+Del dialog in Windows 3.1?" The article was about the creation of the first rudimentary task manager in Windows 3.x, which shared visual similarities with a BSoD. In a follow-up on 9 September 2014, Raymond Chen complained about this widespread mistake, claimed responsibility for revising the BSoD in Windows 95 and panned BGR.com for having "entirely fabricated a scenario and posited it as real". Engadget later updated its article to correct the mistake. Until Windows 8 and Windows Server 2012, BSoDs showed silver text on a royal blue background with information about current memory values and register values. Windows Server 2012, Windows 8 and Windows 10 use a cerulean background instead. Windows 95, 98 and ME BSoDs use 80×25 text mode. BSoDs in the Windows NT family use 80×50 text mode on a 720×400 screen. Windows XP BSoDs use the Lucida Console font while the Windows Vista and 7 BSoD uses the Consolas font. Windows 8, Windows Server 2012 use Segoe UI and attempt to render the BSoD at native resolution, otherwise defaulting to 640x480. Windows 10 uses the same format as Windows 8, but has a QR code which leads to a Microsoft survey about how the blue screen was caused. 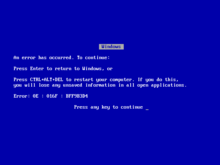 Despite the "blue screen" name, in Windows 9x, the color of the message could be customized by the user. As of December 2016[update], Windows Insider builds of Windows 10 feature the same format as in public release versions, but with a green background instead of a blue one. A stop error as seen in Windows XP, Vista, and 7. In Windows NT family of operating systems, the blue screen of death (officially known as a stop error and referred to as "bug check" in the Windows software development kit and driver development kit documentation) occurs when the kernel or a driver running in kernel mode encounters an error from which it cannot recover. This is usually caused by an illegal operation being performed. The only safe action the operating system can take in this situation is to restart the computer. As a result, data may be lost, as users are not given an opportunity to save data that has not yet been saved to the hard drive. The text on the error screen contains the code of the error and its symbolic name (e.g. "0x0000001E, KMODE_EXCEPTION_NOT_HANDLED") along with four error-dependent values in parentheses that are there to help software engineers fix the problem that occurred. Depending on the error code, it may display the address where the problem occurred, along with the driver which is loaded at that address. Under Windows NT, the second and third sections of the screen may contain information on all loaded drivers and a stack dump, respectively. The driver information is in three columns; the first lists the base address of the driver, the second lists the driver's creation date (as a Unix timestamp), and the third lists the name of the driver. ReactOS, an attempt at creating a free and open-source implementation of a Windows NT-compatible operating system, also features its own BSoD similar to the one in the Windows NT family. By default, Windows will create a memory dump file when a stop error occurs. Depending on the OS version, there may be several formats this can be saved in, ranging from a 64kB "minidump" (introduced in Windows 2000) to a "complete dump" which is effectively a copy of the entire contents of physical memory (RAM). The resulting memory dump file may be debugged later, using a kernel debugger. For Windows WinDBG or KD debuggers from Debugging Tools for Windows are used. A debugger is necessary to obtain a stack trace, and may be required to ascertain the true cause of the problem; as the information on-screen is limited and thus possibly misleading, it may hide the true source of the error. By default, Windows XP is configured to save only a 64kB minidump when it encounters a stop error, and to then automatically reboot the computer. Because this process happens very quickly, the blue screen may be seen only for an instant or not at all. Users have sometimes noted this as a random reboot rather than a traditional stop error, and are only aware of an issue after Windows reboots and displays a notification that it has recovered from a serious error. This happens only when the computer has a function called "Auto Restart" enabled, which can be disabled in the Control Panel which in turn shows the stop error. Microsoft Windows can also be configured to send live debugging information to a kernel debugger running on a separate computer. If a stop error is encountered while a live kernel debugger is attached to the system, Windows will halt execution and cause the debugger to break in, rather than displaying the BSoD. The debugger can then be used to examine the contents of memory and determine the source of the problem. A BSoD can also be caused by a critical boot loader error, where the operating system is unable to access the boot partition due to incorrect storage drivers, a damaged file system or similar problems. The error code in this situation is STOP 0x0000007B (INACCESSIBLE_BOOT_DEVICE). In such cases, there is no memory dump saved. Since the system is unable to boot from the hard drive in this situation, correction of the problem often requires using the repair tools found on the Windows installation disc. Depending on the error number and its nature, all, some, or even none of the parameters contain data pertaining to what went wrong, and/or where it happened. In addition, the error screens showed four paragraphs of general explanation and advice and may have included other technical data such the file name of the culprit and memory addresses. With the release of Windows Server 2012, the BSoD was changed, removing all of the above in favor of the error name, and a concise description. Windows 8 added a sad emoticon as well. The hexadecimal error code and parameters can still be found in the Windows Event Log or in memory dumps. Since Windows 10 Build 14393, Windows 10 has added QR code for quick troubleshooting. The blue screen of death frequently occurs in Microsoft's home desktop operating systems Windows 95, 98, and ME. In these operating systems, the BSoD is the main way for virtual device drivers to report errors to the user. It is internally referred to by the name of "_VWIN32_FaultPopup". A Windows 9x BSoD gives the user the option either to restart or continue. Problems that occur with incompatible versions of DLLs: Windows loads these DLLs into memory when they are needed by application programs; if versions are changed, the next time an application loads the DLL it may be different from what the application expects. These incompatibilities increase over time as more new software is installed, and is one of the main reasons why a freshly installed copy of Windows is more stable than an "old" one. Damaged hardware may also cause a BSoD. In Windows 95 and 98, a BSoD occurs when the system attempts to access the file "c:\con\con" or "c:\aux\aux" on the hard drive. This could be inserted on a website to crash visitors' machines. On 16 March 2000, Microsoft released a security update to resolve this issue. A famous instance of a Windows 9x BSoD occurred during a presentation of a Windows 98 Beta by Bill Gates at COMDEX on April 20, 1998: The demo PC crashed with a BSoD when his assistant, Chris Capossela, connected a scanner to the PC to demonstrate Windows 98's support for Plug and Play devices. This event brought thunderous applause from the crowd and Gates replied after a nervous pause: "That must be why we're not shipping Windows 98 yet." Windows CE 5.0 Blue Screen of Death in action and will automatically restart in 30 seconds. The simplest version of the blue screen occurs in Windows CE (except in Pocket PC 2000 and Pocket PC 2002). The blue screen in Windows CE 3.0 is similar to the one in Windows NT. "Red Screen of Death" redirects here. Red Screen of Death may also refer to an error message used on the PlayStation systems. The Red Screen of Death in postWindows Longhorn build in action. Stop errors are comparable to kernel panics in macOS, Linux, and other Unix-like systems, and to bugchecks in OpenVMS. Windows 3.1, as well as macOS, display a Black Screen of Death instead of a blue one. Windows 98 displays a red error screen raised by Advanced Configuration and Power Interface (ACPI) when the host computer's BIOS has a problem. The bootloader of the first beta version of Windows Vista also displays a red error screen in the event of a boot failure. ^ a b Smith, Dave (4 September 2014). "Steve Ballmer Wrote The Blue Screen Of Death". Business Insider. Business Insider Inc. Retrieved 10 September 2014. ^ Mick, Jason (4 September 2014). 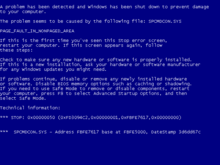 "Microsoft Exec Reveals Steve Ballmer Created Original Blue Screen of Death Message". Daily Tech. DailyTech LLC. Archived from the original on 2015-08-20. Retrieved 10 September 2014. ^ a b Fingas, Jon (4 September 2014). "Steve Ballmer wrote Windows' first Ctrl-Alt-Delete message (updated)". Engadget. AOL. Retrieved 10 September 2014. ^ Condliffe, Jamie (4 September 2014). "Steve Ballmer Wrote the Blue Screen of Death". Gizmodo. Gizmodo Media Group. Retrieved 10 September 2014. ^ Kidman, Alex (5 September 2014). "Steve Ballmer Wrote The BSOD, So Stop Slacking Off". Lifehacker. Allure Media. Retrieved 10 September 2014. ^ Sams, Brad (4 September 2014). "Steve Ballmer wrote the BSOD text". Neowin. Neowin LLC. Retrieved 10 September 2014. ^ Popa, Bogdan (4 September 2014). "Steve Ballmer Himself Created the First Blue Screen of Death Text". Softpedia. SoftNews SRL. Retrieved 10 September 2014. ^ Sharwood, Simon (4 September 2014). "Ballmer PERSONALLY wrote Windows' Blue Screen of Death text". The Register. Retrieved 10 September 2014. ^ Warren, Tom (4 September 2014). "Steve Ballmer wrote the Blue Screen of Death message". The Verge. Vox Media. Retrieved 10 September 2014. ^ a b Chen, Raymond (2 September 2014). "Who wrote the text for the Ctrl+Alt+Del dialog in Windows 3.1?". The Old New Thing. Microsoft. Retrieved 10 September 2014. ^ a b Chen, Raymond (9 September 2014). "Steve Ballmer did not write the text for the blue screen of death". The Old New Thing. Microsoft. Retrieved 10 September 2014. ^ Scott Seely (2000). Windows Shell Programming. Prentice Hall PTR. pp. 232–233. ISBN 9780130254962. BSOD stands for Blue Screen Of Death. One can customize the colors of this screen by setting a couple of variables in the 386Enh section of SYSTEM.INI: MessageTextColor and MessageBackColor. The user can only customize the BSOD under Windows 3.1, 95, and 98. These changes do not work under the Windows NT variants. ^ "Behold the Windows 10 GSOD -- Green Screen of Death". BetaNews. 2016-12-29. Retrieved 2017-01-13. ^ Warren, Tom (December 29, 2016). "Windows 10 testers will now get a Green Screen of Death". The Verge. Vox Media. Retrieved 1 February 2017. ^ Microsoft Windows NT Workstation Resource Kit (1st ed.). Redmond, WA: Microsoft Press. 29 October 1996. ISBN 1-57231-343-9. ^ DOMARS. "Getting Started with WinDbg (Kernel-Mode)". msdn.microsoft.com. Retrieved 15 June 2018. ^ "STOP: 0x00000001 (parameter, parameter, parameter, parameter) APC_INDEX_MIS". msdn.microsoft.com. Retrieved 15 June 2018. ^ "What Are Fatal Exception Errors". Support. Microsoft. 19 January 2007. Retrieved 16 October 2013. ^ Microsoft Corporation (2000). "Patch Available for "DOS Device in Path Name" Vulnerability". TechNet. Microsoft. Retrieved 4 March 2006. ^ Garmon, Jay (12 April 2007). "Video: Bill Gates, meet the Blue Screen of Death". TechRepublic. CBS Interactive. Retrieved 20 December 2013. ^ David W. Martin (6 August 2011). "Black Screen Of Death Plagues Some Mac Users After Lion Update". Retrieved 27 August 2018. ^ "Advanced Configuration and Power Interface Errors on Red Screen". Support (1.3 ed.). Microsoft. 10 January 2015. Archived from the original on 25 July 2015. ^ Kaplan, Michael (7 May 2005). "Longhorn on Virtual PC 2004". Sorting it all Out. Microsoft. Archived from the original on 3 January 2013. ^ Best, Jo (11 May 2005). "Red screen of death?". CNET. CBS Interactive. Retrieved 9 September 2013. ^ Farrell, Nick (3 June 2005). "Microsoft sees red over blue screen of death". The Inquirer. Incisive Media. Retrieved 9 September 2013.